Draculaura™ has worked hard for this day and is dressed in her beast. 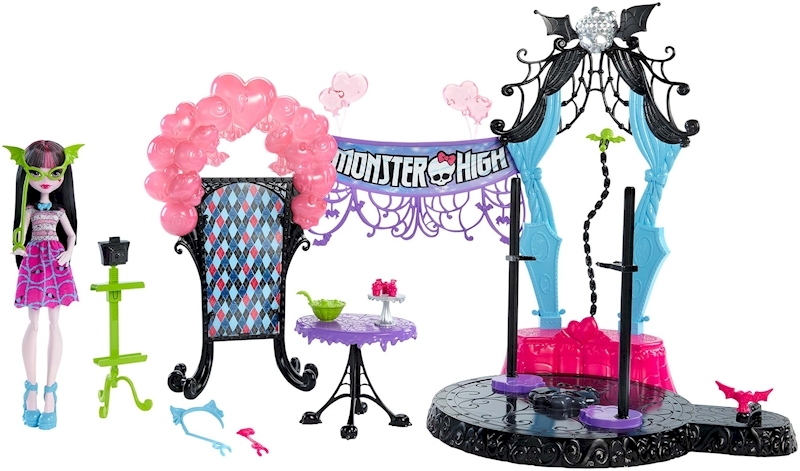 The daughter of Dracula is to-die-for in her signature pink and black with a metallic shoulder piece and bat print, dramatic collar necklace, spider web-themed hairpiece and bat-detailed black shoes. She plans to commemorate the occasion with clawesome accessories for freaky fabulous party snapshots in the photo boo-th. This play set captures all of the action from dancing to photo ops with play spaces, accessories and features for each that expand the possibilities for storytelling and display. Attach two dolls to the dance floor by plugging doll stands into the spots in the floor (other dolls sold separately), then turn the dial to see them dance the fright away!